California is providing extensive urban forestry funding to communities plagued by pollution — and it could be a game-changer for Oakland's most underserved neighborhoods. Kemba Shakur (left) and Kevin Jefferson of Urban Releaf. When Kemba Shakur lived in San Francisco's Bayview-Hunters Point neighborhood as a young kid in the 1970s, the area was plagued by blight and violence. "It was like a warzone," recalled Shakur, who now lives in North Oakland. "I hated that place. It was scary and dangerous." When she returned decades later, she was stunned to see the improvements. The area felt safer and less economically depressed, and a lot of the change, she said, was due to the efforts of the San Francisco League of Urban Gardeners, a nonprofit that planted trees and community gardens in low-income neighborhoods. 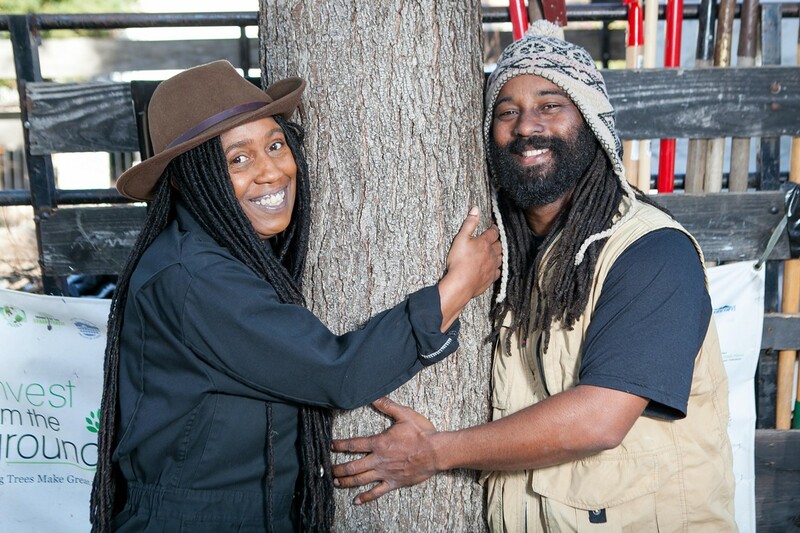 In 1998, Shakur founded Urban Releaf, an Oakland-based urban forestry nonprofit modeled after the San Francisco group. "It's a simple act to plant a tree and maintain a tree. But it can put people to work and improve our environment," she said. Urban Releaf has planted roughly 20,000 trees since its launch, but has consistently relied on a shoestring budget and a staff of volunteers. Soon, however, resources for tree-planting in Oakland could significantly increase. That's because California, as part of its greenhouse gas reduction initiative, has taken the unprecedented move of allocating a large pot of urban forestry money exclusively to disadvantaged communities plagued by pollution. 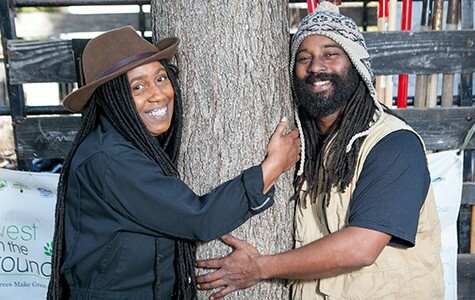 Advocates for Urban Releaf, which has applied for the forestry dollars as part of an ongoing statewide grant process, are hopeful that the new program will go a long way toward adding greenery to historically neglected Oakland neighborhoods. The $18 million urban forestry fund is under the control of the California Department of Forestry and Fire Protection (Cal Fire) and is part of the state's broader cap-and-trade initiative, which was established after the 2006 passage of Assembly Bill 32. That legislation, the California Global Warming Solutions Act, targets climate change by requiring the state to reduce greenhouse gas emissions to 1990 levels by 2020. In 2012, lawmakers passed Senate Bill 535, which established new guidelines for how the AB 32 cap-and-trade program should invest in vulnerable communities, including requiring that at least 25 percent of available funding go toward projects that benefit disadvantaged areas (and at least 10 percent go to projects directly located in those communities). The legislation established specific metrics for "disadvantaged communities" based on environmental, geographic, socioeconomic, public health, and environmental hazard criteria. The state has developed new technology called the California Communities Environmental Health Screening Tool (CalEnviroScreen) to identify communities that are disproportionately burdened by pollution and most vulnerable to its negative effects, given various health and socioeconomic disparities. The state has used the CalEnviroScreen methodology to select US Census tracts considered "disadvantaged" under SB 535 — representing the top 25 percent most burdened areas of California. "The communities that benefit from this program are the ones that in some way suffer disproportionately from the impact of climate change and have measurably [fewer] resources to deal with it," explained Dave Clegern, spokesperson for the California Air Resources Board, which oversees the state's cap-and-trade program. While SB 535 required that 25 percent of the cap-and-trade money benefit disadvantaged areas, state officials set higher standards in certain categories as part of the fiscal year 2014-15 budget. Of the $832 million total available for the greenhouse gas reduction fund, the state allocated $18 million to Cal Fire for urban forestry — and required that 100 percent of that go to disadvantaged communities. While Cal Fire has targeted disadvantaged areas for urban forestry in the past, this is the first time the agency has a grant of considerable size entirely dedicated to disadvantaged neighborhoods. "It's a massive game-changer," said Kevin Jefferson, Urban Releaf project manager. "Pollution is affecting the people in the flatlands of most urban inner cities. The majority of that money should go to those communities." CalEnviroScreen data from the East Bay shows there's plenty of reason to celebrate this focus on the most polluted census tracts. Large sections of East and West Oakland and parts of Richmond all meet the SB 535 disadvantaged communities standard (while only a handful of census tracts in San Francisco qualify). In East Oakland, the neighborhoods surrounding Interstate 880, from Laney College to San Leandro, are particularly bad, with nearly every census tract north and south of the Nimitz freeway heavily plagued by pollution. Many of those tracts fall into the top 15 percent most disadvantaged areas in the state. By proactively targeting disadvantaged neighborhoods for urban forestry, the state has created a more equitable system for doling out these types of funds, Jefferson said, noting that in the past it was much more likely that the most talented grant writers would win awards, not necessarily the neighborhoods with the greatest needs. "This is where the distribution of wealth can happen," he said. Urban Releaf has received fairly consistent financial support from Cal Fire — an average of roughly $20,000 to $50,000 every two years since 2002, according to Shakur. The organization has focused on tree-planting in different parts of Oakland and is hoping to dedicate extensive resources to the flatland neighborhoods that CalEnviroScreen has identified as highly polluted. Jefferson said the group wants to plant trees along the I-880 corridor and around International Boulevard in East Oakland. Urban Releaf recently planted roughly 45 trees and 150 plants along G Street between 85th and 92nd avenues, just south of the Coliseum. With the new Cal Fire SB 535 funding, Urban Releaf last year submitted a proposal for a roughly $750,000 project that would fund the planting of 1,000 trees, 100 sidewalk gardens, and an apprenticeship program that would provide arborist training. But there's no guarantee Urban Releaf will win an award through SB 535, because it's going to be a highly competitive process. According to John Melvin, Cal Fire's urban forestry program manager, the agency has received 169 applications from throughout the state for projects totaling $107 million — nearly 7 times greater than the $15.7 million available for grants (the rest of the allocated $18 million goes toward staffing and administrative costs). "This has high potential to make a big difference both in terms of improving the green canopy for these communities and providing opportunities for jobs," Melvin said. He said Cal Fire is looking for proposals that directly support the state's greenhouse gas emission reduction goals and noted that urban forestry brings many environmental benefits to cities, including storm water treatment and shade for homes (which can lead to reduced energy bills). "This is crucial for what California is trying to achieve." Melvin said that Cal Fire has finished reviewing proposals and will soon invite certain applicants to submit more in-depth proposals as part of a second round. Cal Fire will make its final awards in May or June, he said. In addition to the East Bay's high concentration of disadvantaged and polluted neighborhoods, the City of Oakland has suffered from a lack of funding and resources for tree services — another reason that environmental activists hope that some of the Cal Fire money will end up going toward local forestry projects. In 2008, the city's Public Works Agency had 35 funded positions for tree services, but is now down to 15, according to department spokesperson Kristine Shaff. With such limited resources, the city currently does not plant any new trees (aside from those under certain special grants or parks projects) and the public works staffers dedicated to these services spend most of their time dealing with tree hazards and diseases, maintenance needs, and other basic management tasks. In 2013, the Public Works Agency released a "report card" for its tree services unit, issuing a grade of D-plus, citing deferred tree maintenance due to a lack of resources. Shaff said that the city's trees services unit also submitted a proposal to Cal Fire for SB 535 funds in hopes of financing an in-depth survey of the city's existing tree inventory, which it hasn't done since 2008. That means the city does not have an up-to-date tree count, which advocates said can make it difficult to assess the current environmental benefits of Oakland's trees, and to decide where to direct new resources. "You need to know where you are so that you can have a roadmap of where you're trying to go," Jefferson said. At the neighborhood level, advocacy groups have documented their local tree inventories — at times with depressing results. As part of a recent neighborhood planning initiative in the Elmhurst district of East Oakland, residents repeatedly advocated for more trees, according to Angela Hadwin, project associate with Health for Oakland's People and Environment (HOPE) Collaborative, a nonprofit that facilitated the Elmhurst planning process and has partnered with Urban Releaf. "The one thing that came up over and over was that there were a lot of blocks that just didn't have any trees or just one or two," she said. "That was really eye-opening."